We carry out fire extinguisher servicing in London, Surrey and the whole of the South-East for all types of business. All of our extinguisher engineers are BAFE approved and work to British Standards. If you are a responsible for fire safety for a business, then you must make sure fire extinguisher servicing is carried out annually to meet current fire safety regulations. 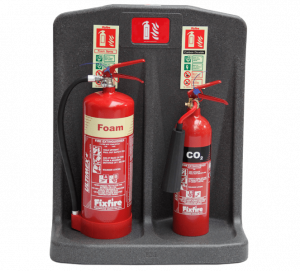 Fire extinguisher servicing is needed to make sure your extinguishers are kept in full working order in the event of a fire. All of our extinguisher engineers are BAFE registered and provide comprehensive fire extinguisher servicing and maintenance in London, Surrey and neighbouring counties. BAFE registration means our team is monitored by an independent 3rd party, so you can be confident that you will always receive a thorough, quality service and meet regulatory and insurance requirements. Your fire extinguishers should be properly serviced once a year by a qualified fire extinguisher engineer. The tamper pin: this has got two jobs. It holds the safety pin in place, but it also lets you see at a glance whether or not the fire extinguisher could have been used. Our engineers will check whether your extinguisher has been used and will refill where possible. The pressure gauge: this tells you whether or not the fire extinguisher is fully pressurized. Sometimes the gauge needle can ‘stick’ as a result of damage or moisture which means the extinguisher could have lost pressure completely – and therefore won’t work – but the gauge indicates all is well. Our engineers will check this for you. The extinguisher body: if the body of the fire extinguisher shows signs of corrosion, dents, gouges etc. it could be dangerous and may even burst. We will make sure all of your fire extinguishers are sound and rust-free. Your fire extinguishers also need to display a label which will give information about its operation, ratings, refilling and anything else worthy of note. If any of this text is no longer legible then the extinguisher will usually need to be condemned. The extinguisher hose: our engineers will check the fire extinguisher hose isn’t damaged, torn or frayed, otherwise it may not work effectively in the event of a fire. Our expert engineers take their jobs very seriously and take pride in leaving our customers fully compliant with the law and their buildings and teams safe. Ring 0845 845 3001 today for a fast, friendly quote, or use our contact form below.